Hey y’all, do you love the Denny O’Neil/Neal Adams issues of Green Lantern/Green Arrow as much as I do? 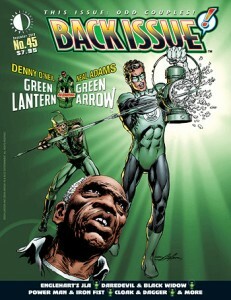 Then you’ll equally enjoy Back Issue #45 when it ships Nov. 10, with its extensive cover feature of that pivotal series. Also in this “Odd Couples” issue, you’ll find features on Vision and Scarlet Witch, Power Man and Iron Fist, Black Widow and Daredevil, Cloak and Dagger, and more! This entry was posted in TNT on 13 October 2010 by Mr. Morrow.